Direct mail promotional product for 3D brand marketing with the Paper Pop-Up Magic Cube! Create lasting impressions for your company. A unique product ready to mail in a #10 envelope with custom 4 color sleeve, it fits in a standard envelope or can be mailed as-is. 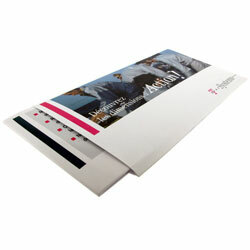 It actually pops-up when removed from the envelope, adding more fun to direct mail campaigns! Get your sample of the Paper Pop-Up Cube today!